And it shall come to pass in the last days that the mountain of the house of Hashem shall be established at the top of the mountains, and shall be exalted above the hills; and all of the nations shall flow unto it. And many people shall go and say, Come, and let us go up to the mountain of the Lord, to the house of the God of Jacob; and He will teach us of His ways, and we shall walk in His paths: for out of Zion shall go forth Torah, and the word of God from Jerusalem. 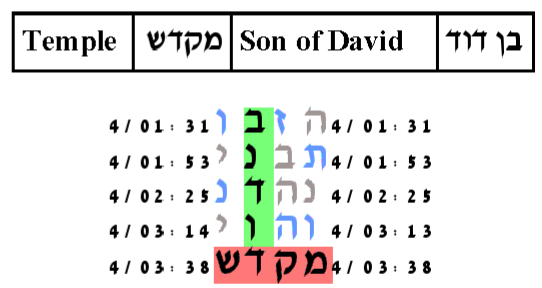 (Isaiah 2:2-3). The mountain is Mount Moriah. Upon this verse Rashi comments that the land of Moriah is Jerusalem. 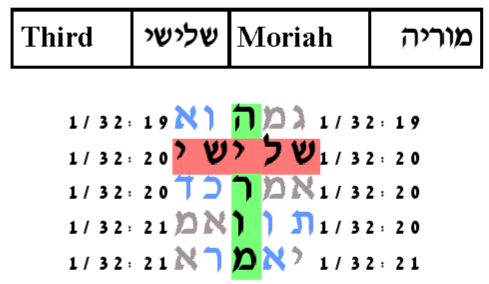 Our Rabbis explained: Jerusalem is called Moriah because from there הוראה, instruction, went forth to Israel. 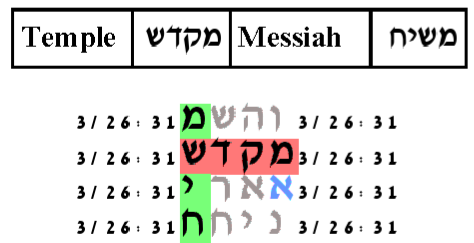 The house of Hashem that the prophet Isaiah speaks of is the Third Temple. Isaiah's vision places the Third Temple as a place for instruction and the bringing forth God's word. The physical place of the Third Temple will be in the Old City of Jerusalem on Mount Moriah, where Abraham was commanded to offer Isaac and where the First and the Second Temples stood. 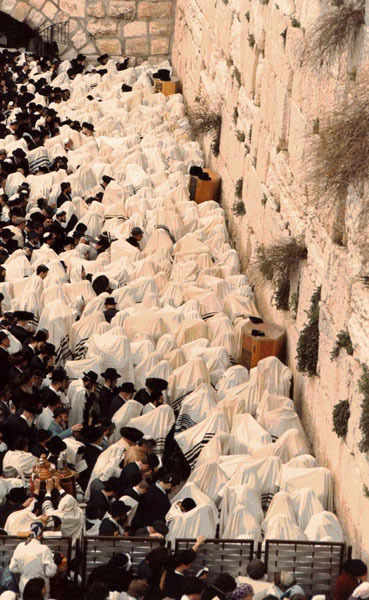 This is the holy place where G-d's indwelling presence, the Shechinah, will be consciously present. This is the place where Heaven touches Earth and where Earth touches the Heavens. It will be a house of blessing for all mankind for there all mankind will experience and see the physical evidence of G-d's Al-mighty absolute presence. 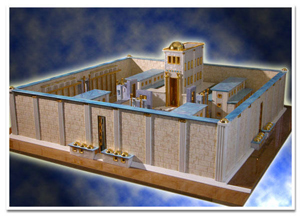 A Model of the Third Temple. 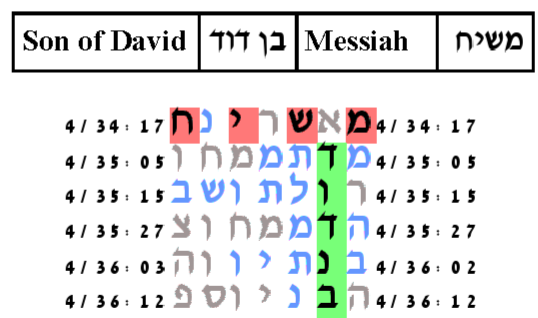 The key words that are relevant to the Third Temple are: Temple, Third, Moriah, Messiah, and Son of David. 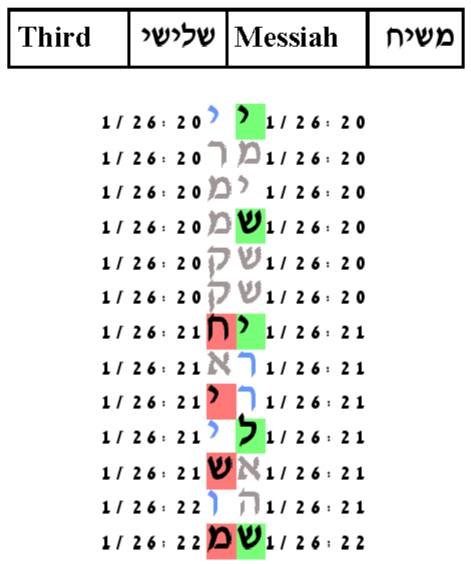 We examine the smallest area tables produced by the Torah text for the ELSs of each pair of these key words. 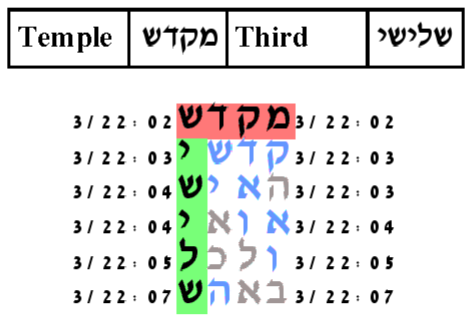 Using our standard protocol, the probability that a text from the ELS random placement text population would produce a combined set of tables as compact as the tables shown below is 1.5/1,000. The cylinder size is 9 columns. The expected number of ELSs is set to 100. The probability that a text from the ELS random placement text population would produce a table as small as this one is 53/1000. The cylinder size is 62 columns. The expected number of ELSs is set to 100. The probability that a text from the ELS random placement text population would produce a table as small as this one is 210.5/1000. The cylinder size is 1082 columns. The expected number of ELSs is set to 100. The probability that a text from the ELS random placement text population would produce a table as small as this one is 29/1000. The cylinder size is 3 columns. The expected number of ELSs is set to 100. The probability that a text from the ELS random placement text population would produce a table as small as this one is 299.5/1000. The cylinder size is 7 columns. The expected number of ELSs is set to 100. The probability that a text from the ELS random placement text population would produce a table as small as this one is 338/1000. 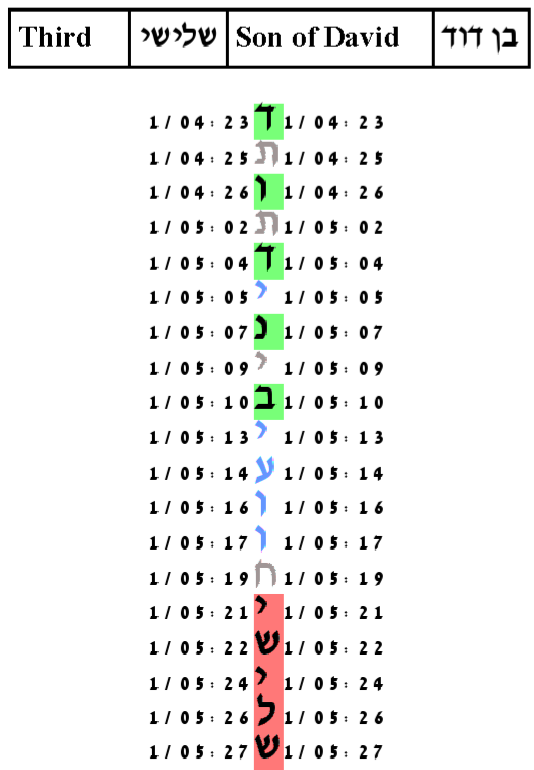 The cylinder size is 17 columns. The expected number of ELSs is set to 100. The probability that a text from the ELS random placement text population would produce a table as small as this one is 315/1000. The cylinder size is 582 columns. The expected number of ELSs is set to 100. The probability that a text from the ELS random placement text population would produce a table as small as this one is 407/1000. The cylinder size is 28 columns. The expected number of ELSs is set to 100. The probability that a text from the ELS random placement text population would produce a table as small as this one is 80.5/1000. The cylinder size is 72 columns. The expected number of ELSs is set to 100. The probability that a text from the ELS random placement text population would produce a table as small as this one is 2/1000. The cylinder size is 63 columns. The expected number of ELSs is set to 100. The probability that a text from the ELS random placement text population would produce a table as small as this one is 476/1000.